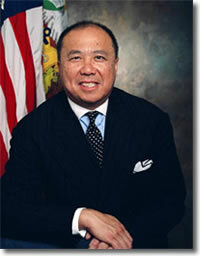 President George W. Bush appointed Edmund C. Moy to the position of Director of the United States Mint in 2006. Director Moy was officially sworn into his five year term on September 5, 2006. The Mint Director serves as chief officer of the United States Mint and operates under the directions of the Secretary of the Treasury, currently Henry M. Paulson, Jr.
Moy’s responsibilities are significant when it comes to money production. In FY 2005, the United States Mint manufactured more than 15 billion circulating coins, and generated revenue of $1.77 billion that contributed $775 million in earnings to the United States Treasury. In FY 2006, it produced 16.2 billion coins for circulation and contributed another $750 million to the Treasury. According to the U.S. Mint website, prior to becoming Director, Mr. Moy was Special Assistant to the President for Presidential Personnel at the White House. Moy served on a panel in the creation of the U.S. Department of Homeland Security. He was responsible for staffing high-ranking positions in the U.S. Department of Justice and the Office of National Drug Control Policy. Between the two Bush administrations: Moy spent eight years working in the private sector with venture capital firms and entrepreneurs. He was also on the board of several companies and nonprofit organizations. 1989 to 1993: Moy was appointed during the President George H. W. Bush administration as Director of the Office of Coordinated Care Policy and Planning at the federal Health Care Financing Administration at the U.S. Department of Health and Human Services. 1979 to 1989: Moy was a sales and marketing executive for Blue Cross Blue Shield United of Wisconsin. Moy is a native of Wisconsin, and graduated from the University of Wisconsin in 1979 with majors in economics, international relations and political science. Chairman Gutierrez, Ranking Member Paul, Members of the Subcommittee, thank you for inviting me here today. I welcome the opportunity to testify on the “Coin Modernization and Taxpayer Savings Act of 2008,” H.R. 5512. It is based, in part, on the recommendations of the Treasury Department’s proposal, introduced as H.R. 3330, to reduce the cost of coinage. You are to be commended, Chairman Gutierrez, for your leadership on this matter and for providing an opportunity here today for open, public debate on what the right course of action should be. Mr. Chairman, as I have met with you and many of your colleagues on this subcommittee to discuss the spiraling costs of our Nation’s coinage, I have heard only support and encouragement to come forward with a solution to address this problem. Portions of this legislation would take a major step toward achieving such a solution. I support it with two specific objections which, if addressed, will ensure that the legislation will not delay or offset the significant savings to our taxpayers that this measure otherwise promises. All other statutory provisions applicable to coinage – denominations, size, required inscriptions and other factors are unaffected. This authority should be employed to anticipate and prepare for a timely change in materials to avoid unnecessary costs borne by the taxpayers. Under current law, we have evaluated alternatives from a cost standpoint, but without more express permission from Congress, we are reluctant to proceed unilaterally to fully evaluate and test alternatives in the production setting and marketplace. The Department of the Treasury is requesting the ability to determine the metal content of the Nation’s coinage because it would ultimately result in significant taxpayer savings by providing the Department with the flexibility to respond to changing market conditions through an open, fair and deliberative process. Thus, the Department and the United States Mint can support the “Coin Modernization and Taxpayer Savings Act of 2008,” but only if two specific objections—that I will mention throughout my testimony—are removed or addressed. Producing lower denomination coins under their face value is now a common problem experienced by mints worldwide, exacerbated in the United States by the higher volume of coins we produce for the American economy. The current situation is unprecedented. Never before in our Nation’s history has the Government spent more money to mint and issue a coin than the coin’s legal tender value. The rising prices of nickel, copper, and zinc have dramatically increased the costs of producing our Nation’s circulating coinage. The problem we face today is clear, and it is not going away unless we act: some of the coin alloys specified in our current laws are no longer economical for Americans. For instance, in Fiscal Year 2007, it cost 1.67 cents to make each one-cent coin and 9.53 cents to make each five-cent coin. As a result, with each new penny and nickel we issue, we also increase the national debt by almost as much as the coin is worth, and these losses are rapidly mounting. Current law forces the United States Mint to make coins at a loss to the taxpayer. However, the Department of the Treasury has decades of proven success in determining the materials for our highest and lowest coin denominations, and now is simply proposing to save taxpayers hundreds of millions of dollars per year by determining the materials for the other coin denominations. We anticipate that, by changing the compositions of just the 5-cent and one-cent coins to less expensive materials, we can save the Nation up to $30 million for the one-cent coin and up to $70 million for the 5-cent coin. That’s a cumulative annual savings of $100 million without compromising the utility of these coins. Our first major objection to H.R. 5512 relates to the provision mandating five years of consecutive losses (as stated in Section 3(c)(1)) because it deprives the United States Mint of needed flexibility to act as quickly as possible to save the taxpayer money. H.R. 5512 assures that a significant portion of the $782 million in seigniorage we returned to the taxpayer in FY 2007 would be put at risk over time as we helplessly watch our seigniorage evaporate and then become negative for five years before the Secretary can change coinage materials. This is because section 3(c)(1) prohibits a change in coinage material until the taxpayers have sustained five consecutive years of losses from the respective coin denomination. This guarantees that the taxpayers must suffer losses, when the better course of action is to anticipate and prevent such adverse taxpayer consequences. Similarly, the five-year loss test in H.R. 5512 also prevents consideration of the benefits of making changes to the materials of all the coins commonly used in vending machines and other coin-operated devices. While our present problem and need is to address only the penny and nickel, the intent of the Treasury proposal is to enable the United States Mint to change the materials used for all denominations, when necessary. That means taxpayers could see a potential savings on all denominations. It would also minimize the potential impact on the vending and coin handling industries. The problem with the bill we are discussing today, H.R. 5512, is that it addresses one denomination at a time based on the volatility of metal prices. The vending and coin handling industries would potentially have to repeatedly face costly changes denomination by denomination. The United States Mint is required by law to produce coinage to meet the needs of commerce. In this vein, we need to avoid the inclination to focus on the one-cent and five-cent coins just because their production costs exceed their face values. Rather, we need to consider the relationship of new materials for all of our coins. Regardless of the relationship between production costs and face value, any change in production processes or materials that lowers the cost to produce coinage saves the taxpayer money. Finally, the five-year loss test in the bill contradicts the view that the Government should take prompt and decisive action to prevent avoidable losses to the taxpayer, rather than sustain years of unrecoverable expenses. The five-year rule significantly restricts the United States Mint’s ability to take advantage of advancements in material technologies to benefit the American taxpayer. We, therefore, cannot support this provision and, accordingly, recommend that you remove section 3(c)(1) from the bill. Any change that lowers the cost to produce coinage preserves seigniorage and saves the taxpayer money. We need that flexibility to respond whenever appropriate. Thus, delegating authority to the Department of the Treasury without a prescribed period of sustained losses solves the current dilemma of inability to respond to changing metal prices. Our second objection to H.R. 5512 is the requirement in section 4 that mandates the production of one-cent coins made primarily of steel 180 days after the enactment of this legislation, without first obtaining any public input. It restricts the United States Mint’s flexibility to ascertain and employ the most cost-effective material and production process timeframe. Although plated steel appears to have merit as a viable low-cost alternative, this has not been proven. Mandating a primarily steel penny eliminates any consideration of other alternatives that may prove more cost effective, either now or in the near future. Furthermore, requiring the use of steel exposes the United States Mint to the same vulnerability of volatile metal prices that we currently experience. The Canadian example of a similar coin cited in H.R. 5512 does not reveal that Canada has the flexibility to change back and forth between orders for its traditional zinc penny and the steel penny based on the prevailing cost and availability of these metals. This flexibility, interchangeability, and co-circulation are all essential factors to manage costs and to be able to reliably supply the necessary volumes this denomination requires. However, if a steel penny is mandated, there are practical considerations that make this mandate imprudent. Because steel is significantly harder than zinc, die life is a major factor that will determine whether appreciable cost reductions can even be achieved. It would make little sense to reduce the cost of materials used in the penny, only to have the manufacturing costs of producing replacement dies for the penny increase dramatically with no ultimate benefit to the taxpayer. The United States Mint anticipates a reasonable timeframe to make these critical decisions to be 18 to 24 months to properly implement this mandate and do our part to bring a penny made primarily of steel to the marketplace. This includes engaging in an open process to gather suggestions from the public that should take about two months. We estimate needing three to five months to be able to determine specifications for a cost effective copper-plated steel penny blank that has a potential of reducing the cost of that denomination. Potential vendors supplying penny blanks to the United States Mint will need up to a year and a half or more to make the arrangements to procure steel feedstock and make investments in machinery necessary to be fully capable of producing penny blanks at the capacity required by the United States Mint. required within 180 days, production of pennies will be limited to the capacity level of the blanks supplier at that time. This reduced production capacity will potentially result in a coin shortage. Prescription of exact material and production timeframe denies flexibility, interchangeability and co-circulation, which are all essential to the United States Mint’s maximizing cost savings for the taxpayer. Therefore, we cannot support the provision that summarily mandates conversion to a steel-plated penny and, accordingly, recommend that you remove section 4 from the bill. Congressional Precedent Exists for Delegating the Authority to Select Coinage Materials to the Department of the Treasury. I want to stress that delegating the authority to test and select alternative materials to the Secretary of Treasury is a sound, legal, and proven approach to determining the composition of our Nation’s coinage. Do not be swayed by some critics who have raised concerns that it would be unprecedented or unconstitutional because it would cede Congress’s authority to decide the weight and composition of circulating coins to the United States Mint. Twice in the last 50 years, the Government took action to protect our taxpayers from needlessly bearing the increased costs of coinage materials. In 1965, as the value of silver climbed because of industrial demand, Congress approved a change in the composition of the dime, quarter-dollar, and half-dollar coins from silver to cupro-nickel clad. Similarly, in 1974, Congress granted to the Secretary of the Treasury the authority to vary the copper-zinc alloy of the one-cent coin. After several years of rising copper prices, again because of industrial demand, the Secretary exercised this authority in 1982, changing the alloys in the one-cent coin to its present composition of copper-plated zinc. So, history and economic reality tell us why we are in the current situation, and also tell us that it will recur in the future if we fail to act. That is why we seek a durable solution that will substantially reduce the cost our citizens must pay for the Nation’s coinage now and in the future. Congress has already delegated the authority to select the composition of some coins to the Department of the Treasury and the United States Mint. We have capably coined and regulated money under laws passed by Congress since 1792. Most recently, just 11 years ago, Congress passed the United States $1 Coin Act of 1997, which granted to the Secretary of the Treasury the sole discretion to select the materials for the $1 coin. Thus, the Department’s current proposal builds on these precedents established by Congress. Indeed, it does no more and no less than the United States $1 Coin Act of 1997 did for the $1 coin. By delegating the authority to the Secretary of the Treasury to select circulating coinage compositions, Congress can be assured such changes will be made effectively. The United States Mint would accomplish these changes by employing an open, public process to determine new coinage materials. Specifically, we will seek public and industry comment to ensure consideration of all factors relevant to the acceptability of new coinage materials, including physical, chemical, metallurgical and technical characteristics; material, fabrication, minting, and distribution costs; material availability, sources of raw materials, and environmental impact; coinability; durability; effects on sorting, handling, packaging and vending machines; appearance; resistance to counterfeiting; and commercial and public acceptance. Once the agency has a comprehensive inventory of these factors and their relative significance, the United States Mint would then employ an objective, competitive, and public process to solicit and evaluate proposals for new coinage materials. Circumventing such a process prior to changing the composition of the one-cent coin not only belies the Treasury proposal’s intent to use an open and public process to select all coinage materials, but also is inconsistent with the process that is outlined in section 3(a) of this bill. Together, as we consider alternative metals for our Nation’s coinage, I want to stress our strong preference for engaging in the open deliberative process set out in Section (3)(a), that provides for public input, as well as an opportunity to test available options and fully evaluate the alternatives; this applies to the penny no less than the other denominations. This process will allow us to address the following three central issues: continuing volatility of metal prices, coin material uniformity and use among denominations, and providing taxpayers the best result for their investment in coinage. The Department of the Treasury and United States Mint support H.R. 5512, but only if the objectionable provisions are removed or addressed. We are then prepared to implement this legislation as expeditiously as possible. Our intent is to enable the United States Mint to be pro-active, versus reactive, in efficiently serving the American public in making the Nation’s coinage. Due to the volatile nature of metal prices, the taxpayer will be better served by a nimble, flexible United States Mint which can address the problem in its entirety, not piecemeal. We want to get this done right, and we know that the Congress, the public, and the many stakeholder industries and interests share that view and want to contribute their expertise and perspective. We expect, and welcome, your subcommittee’s oversight at every step in this process. We appreciate your attention to this issue. I hope that the Committee will consider the improvements I have suggested; they will help ensure that that we achieve a result that will serve the best interests of the country. Thank you, Mr. Chairman, for the time you have provided me today. It’s great to be here with you today to talk about the future of American coinage and answer any questions you have for me. I’m also interested in hearing what you think of this year’s symposium so far. This is the first time we have offered our AIP participants some in-depth workshops on the process of rendering artistic expression into beautifully designed coins. This is part of my focus on achieving design excellence — consistently beautiful coins that are the highest expression of American heritage. Will the world look back 100 years from now and declare it to be the unsurpassed Golden Age of American coin and medal design? This is the challenge I put before you today. I have directed a number of steps in order to achieve design excellence. Step 1 – We made it a permanent part of who we are in the United States Mint’s mission statement: The men and women of the United States Mint serve the nation by exclusively and efficiently creating the highest quality, most beautiful and inspiring coins and medals that enable commerce, reflect American values, advance artistic excellence, educate the public by commemorating people, places and events and fulfill retail demand for coins. Step 2 – We made it an integral part of where we are going, via the United States Mint’s vision statement: "To embody the American spirit through the creation of our nation’s coins and medals." We made it integral by making it one of the United States Mint’s five key strategic goals – Goal No. 3 – Achieving greater excellence in coin and medal design. Step 3 – I made a public statement at the FIDEM Art Medal World Congress in September, an international announcement to the world community of numismatists that I expect the United States Mint to lead the world in a neo-renaissance of coin design. Step 4 – We have formed a Design Excellence Working Group made up of a representative from the director’s office, the associate director of sales and marketing and the associate director of manufacturing. This group is developing a white paper on what measures we should take to achieve a neo-renaissance in coin and medal design at the United States Mint. Step 5 – We are addressing the past so we can focus on the future, via the Ultra High Relief Project. The 1907 Saint-Gaudens Liberty $20 Gold Piece (known popularly as the Saint-Gaudens Double Eagle) has come to signify great art and great American coin art. In 2009, the United States Mint will re-create the Saint-Gaudens Double Eagle in Ultra High Relief, 27 millimeters in diameter with Roman Numerals, extremely close in design to the original 1907 gold piece. Americans will want to own this coin not only for its very high relief but also for its rare beauty and history. Everyone is always comparing new coins to the iconic coins of the Golden Age of American coin design, especially Saint-Gaudens. So we are haunted by the constant reminder of one of the United States Mint’s greatest disappointments — when we could not deliver on Saint-Gaudens’ vision of Ultra High Relief and had to compromise art for production. We have the technology now that we didn’t have in 1907. So I have laid down this new challenge for the beginning of this new century, to take up the vision of Augustus Saint-Gaudens and the art of Ultra High Relief one more time, and this time finish what was started in 1907. We will make a few bows to modernity: The coins will bear the revised date in Roman numerals in 2009. We will use the same font and location of "In God We Trust" from the 1908 Double Eagle on the new coin’s reverse. Modern equipment also may create a slightly raised edge. By producing an Ultra High Relief Saint-Gaudens Double Eagle, we will put our design past to rest so we can concentrate our focus on our design future. 1. Our coins and medals shall look American. America’s democratic character – its preference for simplicity, its ideal of equality. The importance we place on freedom. Our admiration for our greatest leaders – who are noble but humble (Alexander Gardner’s photo of Abraham Lincoln). The struggle to be as great as our principles (Martin Puryear’s sculpture "Ladder for Booker T. Washington"). The never-ending drama of the "American experiment." The courage, determination, and sacrifice required by those who have defended America’s founding principles ("Washington Crossing the Delaware"). The strength of character Americans believe is essential to upholding and realizing our ideals. Our work on the Little Rock Central High School Desegregation Silver Dollar is very American art. It shows our democratic character, our struggle to improve our society, and the never-ending drama of the American experiment, yet it is able to depict its living participants so well, they can identify themselves without seeing a portrait. 2. Our coins and medals shall reflect the artistic period they were created in. This winter, the associate directors for manufacturing, and sales and marketing and I visited three mints in Europe. We visited La Monnaie de Paris (the French Mint), which has produced the best art medals ever minted. We also visited the medallic art school connected to the Italian Mint and the Vatican for its history of minting medals for the popes. French and Italian medals reflect the character and nature of the country that struck them. They reflect something of the age in which they were made – baroque, art deco and modern. You can immediately distinguish between an Italian art deco and a French art deco coin or medal. Our goal is to have American coins instantly recognizable for their origin and era in the same way that European coins are. The forward-facing portrait of Thomas Jefferson on our Westward Journey Nickel Series is a great example. Not only was this the first time a forward facing portrait was done on a circulating coin, it was also symbolic of Jefferson’s forward facing policy of westward expansion. 3. Our coins and medals shall tell a story. The main reason why I think the Saint-Gaudens Double Eagle was such an iconic coin was that it told the story of an America at the beginning of the 20th century. Liberty strides confidently and powerfully forward in a Greco-Roman inspired gown away from the U.S. Capitol in the background, with a torch to light the way in her front hand and an olive branch in her back hand. The Saint-Gaudens Double Eagle demonstrates that liberty is central to the American spirit, has its roots in Greek and Roman civilization, is beautiful and attractive to all and, having been established in America, is marching forward into the world. Wherever Liberty goes – when preceded by God or knowledge – peace and victory follow. On the reverse, a young eagle flies during a sunrise. This is America, young and strong, in its ascendancy with a bright future before it. Let’s not over-rely on portraiture. When we have to do it, let’s tell a story, too, and not make it a photographic image. When we don’t have to do a portrait, let’s not do one. Have we moved too far toward realism vs. artistic creativity and what makes coins American? I believe we have. Our Congressional gold medal honoring the Tuskegee Airmen does exactly this. There is symmetry between the three pilots in profile on the obverse and the three planes used on the reverse. 4. Our coins and medals shall advance our craft. Let’s have the United States become known as an innovator. Where we have flexibility, let’s explore allegory. Let’s allow our design dreams to push our technological abilities to the cutting edge. If low relief is not required, let’s explore using relief as part of our artistic expression. We have unlimited design opportunities with our 24-karat gold and our platinum coins. Let us not waste those opportunities. 5. Our coins and medals shall be beautiful. Our canvas is small and circular but uncommon beauty can exist in any size and shape. Will our coins and medals be favorably compared with the Italian Renaissance, whose designs were considered the pinnacle of medallic design, so much so that they inspired Augustus Saint-Gaudens to create the Eagle and Double Eagle? The designs of the best Renaissance medals were simple and well-executed, and spoke volumes. They were proportionate to the size of the medal and designed to maximize their circular nature. I am the 38th Mint Director and my goal is that the 57th Mint Director in the 22nd century will want to recreate the Neo-Renaissance in coin design that began with us. I want to surpass the Golden Age of coin design which began at the start of the 20th century. If the 20th century continues to be called the Golden Age, I want the 21st century to be known as the "Platinum Age" of coinage. That is my charge to you. Thank you, Ken, and good morning everyone. I am delighted to be here and want to begin by congratulating FIDEM, its President Carlos Baptista de Silva, and its Honorary President Lars Lagerquist on the 70th Anniversary of FIDEM and the 30th Anniversary of the FIDEM Art Medal World Congress. I also want to say thank you to the ANA and its President Barry Stuppler for hosting this event and inviting me to participate. The United States Mint has enjoyed an excellent relationship with the American Numismatic Association for many years and is delighted to take part in the FIDEM Art Medal World Congress. This is my second visit to the ANA museum, and I am looking forward to attending the FIDEM show there and seeing your theme, Passages to Reconstruction, carried out in many beautiful medallic sculptures on display. As the 38th Director of the United States Mint, I’d like to say “welcome” to all the artists from other nations around the world as well as to our American medallic artists, including Don Everhart and Jim Licaretz of the United States Mint. I also wanted to say a special hello to Don Scarinci, who serves on our Citizens Coin Advisory Commission. I have read Don’s treatise on arts medals and for those who will attend his seminar, you are in for a special treat. I have been Director for more than a year now and am enjoying every aspect of it. I accepted this invitation because I wanted to talk to you about my ambitions and goals for coin and medal design at the United States Mint. First, I want and intend to spark a Neo-Renaissance of coin design and achieve a new level of design excellence that will be sustained long after my term expires. I believe design excellence at the United States Mint is something medallic artists and your organization can influence. Second, I want you to know the first steps that we are taking to make vision into reality. Finally, I want to invite you to contribute to our efforts to create a renaissance in coin design. Few things are more personal than currency – it is part of what defines America. That’s what Saint-Gaudens illustrated so well – his 1907 Double Eagle says so much about the U.S. at the turn of the century and what it aspired to be. The Saint-Gaudens Double Eagle is a sculpture executed on a small circular surface. On the obverse, Saint-Gaudens shows us Liberty, personified by a beautiful woman striding powerfully forward wearing a Greco-Roman gown, leading the way with a torch in her front hand and an olive branch in the back hand. From this design we intuit that liberty is central to the American spirit, has its roots in Greek and Roman philosophy, is beautiful and attractive to all, and wherever Liberty goes, when preceded by God, peace follows. On the reverse is a young eagle flying during a sun rise. This is America, young and strong, in its ascendancy with a bright future before it. An artistic triumph, the coin succeeds because it so completely embodies the American spirit of the age. From my perspective, that is what makes a coin produced in the U.S. great: truly American, capturing our national psyche, and a stunning piece of art. My dream and hope is that there will be a new renaissance in American coin and medal design at the beginning of this new millennium and that the world will reflect back 100 years from now and say that the beginning of the 20th century was great, but the 21st century was even better. We have begun taking some small steps toward our vision. The United States Mint began a program in 2004 called the Artistic Infusion Program, AIP for short, intended to shake things up and bring new energy to coin design at the United States Mint. Several hundred applications were accepted from artists representing a broad spectrum of mediums including painting, sculpture, graphic design and drawing and illustration. In the first class we had 24 artists who worked on designs for the Westward Journey Nickel Series” and 50 State Quarters® Program. In 2005, we added some designers to the class and had them submit designs for a wide range of coins – a nickel, quarters, the American Eagle Platinum Coin program and the Jamestown 400th Anniversary Commemorative coins. The 2007 class has seven Master designers, seven Associates and four students and they are being invited to submit designs on an ever wider range of coins and medals. To date, AIP artists have won 33 of 53 commissions and have brought new ideas and vitality to our artistic efforts. When I became Director, I wanted to inspire all of these artists–the current class of Artistic Infusion Program artists and the sculptor/engravers who are employees of the United States Mint. All the artists were invited to submit designs for the First Spouse coins and medals, the companion series to the Presidential $1 Coin Program. So I took them to the White House to look at the First Ladies’ portraits first hand. I wanted them to see original source material and the White House is the largest repository of First Lady portraits. I took them to the National Gallery of Art where a friend of mine is a curator of Italian Renaissance Art and whose doctoral dissertation was on Renaissance medals. She led a private tour to look at the collections, both on display and in storage. Because Saint-Gaudens was so inspired by the classicism, balance, and proportion of Renaissance medals, I wanted our artists to see first hand what the fuss was all about. I also took everyone to the State Department where one of the Nation’s best collections of early American decorative art resides. We took a look at the diplomatic reception rooms – which were richly paneled with moldings from several historic homes. They contained a set of Paul Revere’s silver and housed the desk where Thomas Jefferson wrote the Declaration of Independence. What’s good about current coin and medal design at the United States Mint? We do a good job of commemorating people, places and events – our country’s history and culture–and we keep getting better at it. Our best work establishes an emotional connection: The Norman Borlaug and Tuskegee Airmen Congressional Gold Medal obverses have received praise. Both are by Phebe Hemphill, one of our newer sculptor/engravers, who is capturing the essence of the person or event as well as the image. AIP artist Richard Masters’ gave us a wonderful evocation of the walk of nine black teenagers into segregated Central High School on the Little Rock Central High Desegregation 50th Anniversary Commemorative Silver Dollar obverse. Don Everhart’s Statue of Liberty design–the reverse on the entire Presidential $1 Coin series–is another example of exemplifying the American spirit. And using the Statue of Liberty on the reverse was a creative way to make sure that liberty was on the coin, in symbol if not in word. His Dolley Madison First Spouse obverse also captures the energy of James Madison’s vivacious wife. These are a just a few examples of how overall our designs are improving. We are also proud of the result of interesting design innovations like the forward-facing Jefferson nickel, so appropriate in showing a forward thinking president who had the foresight to expand our country westward through the Louisiana Purchase. And importantly, breaking from the tradition of using a profile, a forward-facing subject brings a 21st century perspective to an historic era. We are raising the bar of what we will and won’t except. We’ve redefined our aesthetic standards upwards, employing digital engraving and encouraging free form. The five annual state quarters are, generally speaking, up to the states. They give us five themes in narrative form, we produce designs and then the Governor recommends a finalist. Then the Secretary of the Treasury approves that choice. The four coins in the Presidential $1 Coin Series to be produced annually through at least 2016 call for portraits of the Presidents, and our Citizens Coinage Advisory Committee is rightly insisting those portraits be of the Presidents at the same age as when they held office. The four First Spouse Coins and medals have to be portraits on the obverse but offer some flexibility on the reversebut the design needs to be emblematic of the life and work of the First Spouse. We are nearly always carrying out special coin legislation. Currently, it is the new Lincoln Penny four-coin series for 2009 to commemorate various stages of Lincoln’s life on the 200th anniversary of his birth. There is variety in these Congressional commissions but not a lot of flexibility. Congressional Gold Medals offer the most flexibility in terms of relief, if not subject matter. The Dalai Lama Congressional Gold Medal will be unveiled in mid-October, and we think the obverse by Don Everhart captures the peace and joy of the 14th Dalai Lama’s personality. The reverse inscription is the work of Joseph Menna, a medallic sculptor who is also our number one digital engraving expert. For rotating designs, one-of-a-kind medals and circulating coins, we possess good everyday skills, well above functionality and getting better all the time. We are not yet at the highest point of our reach in medal or coin design. Of course, there are considerable constraints – for instance when Congress mandated the first American 24-karat gold coins in 1996, they also dictated the design – the James Earle Fraser buffalo and Indian head design from 1906. It’s a beautiful design but leaves no room to grow from the experience and strive for new excellence. Despite these constraints, wherever the United States Mint maintains flexibility, I want to spark a new awakening of excellence in coin design, and embody the American spirit in new and renewed allegorical or iconic symbolism. The 24K gold coin and bullion program is a golden opportunity for this. After the first year, the 24K gold coins and platinum designs are not dictated by Congress. Another opportunity is in my own Mint Director’s medal. I have been bombarding Sculptor-Engraver John Mercanti with ideas. I have been impressed with the great sculptor Frederick Hart, whose most famous work is Ex Nihilo, Maquette, which graces the National Cathedral’s west façade. His work is modern yet classical, allegorical yet approachable. So one idea I have shared with John and his team is to have an incomplete portrait of me on the obverse. I do not feel that God is finished, and I know I am far from perfect. My portrait should reflect that. For my reverse, some of the ideas that I have shared include a modern rendition of Lady Liberty to represent the era during which I served as United States Mint Director. This modern rendition would feature liberty, personified by a beautiful woman, but more multi-ethnic in character because today, liberty is not a Caucasian concept. And compared to Saint-Gauden’s vision, I would put Lady Liberty on a diet and make her more muscular as liberty at the beginning of the 21st century has a much more muscular and forceful presence in the world. And because I serve a President who believes that liberty is God’s gift to the world and not just western civilization, I recommended a wardrobe change to a gown that was less Greco-Roman and more minimalist. Because the Director’s medal has fewer statutory constraints than our circulation coins, I would like to see higher relief, so it becomes more like an arts medal and less like a big circulating coin. In recent American Eagle Platinum Proof Coin designs, allegorical figures have made a welcome return to American coinage with reverses representing the legislative, executive, and judicial branches of government. The next American Eagle Platinum Proof Coin designs will focus on America’s founding documentsthe Declaration of Independence, Constitution and Bill of Rights. The goal is not to show the documents themselves but to evoke iconic images of the intelligence and spirit of the Americans who created them and the values that sustain those documents today. Some of the opportunities we have in the near-term to raise the bar of design excellence in American coinage and medallic art include Congressional Gold Medals, national medals and the 2008 American Bald Eagle commemorative – celebrating the 35th anniversary of the Endangered Species Act – which will show the evolution of the eagle from hatchling to adult. Of course, the bar that was set by Saint-Gaudens and others in the early 20th century is very high and hard to reach. But by assembling the right talent, providing the right inspiration, communicating American values and evoking the American spirit, we can spur a Neo-Renaissance in American coin design. We will allow the golden age of coin design to inspire and guide us but the future is not in recreating the past. It is in striving to uniquely capture the start of a NEW millennium. Within natural constraints, I intend to lead the United States Mint to create the best, most beautiful coins and medals in the world, and some of the finest in history. At the next call for artists in the United States Mint’s Artistic Infusion Program, I invite you to apply and help us take coin and medal design to the next level. Again, my congratulations to you and to FIDEM on your history of achievement in medallic artistry. Thank you for inviting me to open the 30th Art Medals World Congress. In the closing month of Fiscal Year (FY) 2006, I had the honor of being sworn in as the 38th Director of the United States Mint. I am both pleased and fortunate to begin my tenure at the helm of a venerable, 214-year old American institution that is widely recognized as the world’s premier manufacturer of coins. While the United States Mint has a long and rich history, let me assure you that we are also strongly positioned to fulfill the needs of the nation now and in the future. Achieving a top ranking in the American Customer Satisfaction Survey for the seventh consecutive year. The Benjamin Franklin Commemorative Silver Dollars honoring the tercentenary of the birth of one of our nation’s founding fathers. FY 2006 was not without its challenges — by the fourth quarter, steeply rising metal prices had pushed the cost of manufacturing the one-cent and 5-cent coins above face value. Although circulating coin production actually increased over the previous year, there remains continuing uncertainty on future demand levels for circulating coinage. FY 2006 also heralded the beginning of an organization-wide restructuring effort to reorient our workforce to the business requirements of the future and refocus on mission-critical objectives. We will be facing these challenges for some years into the future, and we remain fully committed to fulfilling our mission to the nation. We will continue our efforts to modernize our coin production materials and technology; increase the flexibility and future capability of our workforce; and respond to the opportunities presented to greatly expand our numismatic business. We look forward to a busy and exciting FY 2007 at the United States Mint as we prepare for the launch of five new 50 States Quarters coins; commemorative coins honoring the San Francisco Old Mint, the Jamestown 400th Anniversary, and the Little Rock Central High School Desegregation 50th Anniversary;and new products authorized by the Presidential $1 Coin Act of 2005. These include circulating $1 coins honoring the Presidents of the United States, featuring four coins each year minted in the order that they served. The year 2007 will feature Presidents Washington, Adams, Jefferson and Madison. The Act also authorizes the mintage of complementary gold bullion coins and bronze medals honoring the spouses of the presidents. Our FY 2006 successes included continuing to meet the demands for circulating coinage, delivering beautiful products to our customers, and achieving exceptional results for the American people. These successes are a result of the outstanding contributions of our workforce. We stand ready to provide the nation with an even stronger FY 2007.